Siborg has released a new introduction video for LCR-Reader-MP. The video goes over the basic features and functions of the multipurpose device. It also shows how to set basic settings in the device. The video has been published on Youtube. LCR-Reader-MP is a new model in the LCR-Reader family of handheld LCR- and ESR-meters. The device has a 0.1% basic accuracy and various test modes and features. Recently, Siborg had sent the LCR-Reader-MP to Navair Technologies for calibration. After receiving the results, Siborg is able to issue a NIST traceable calibration certificate for the device. The LCR-Reader-MP has also received FCC certification. 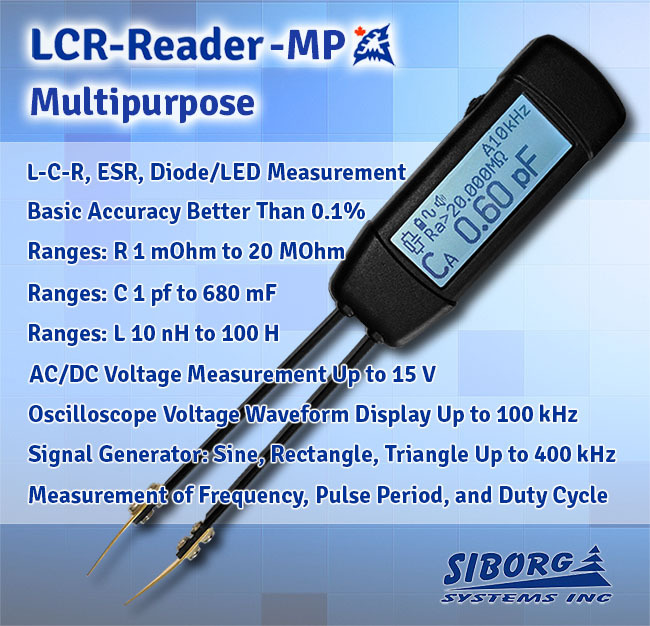 The LCR-Reader-MP is now available for pre-order from Siborg in the online LCR-Reader Store. Multipurpose LCR, ESR and Diode/LED tester from Siborg Systems Inc.